Our Office is open 10am - 3pm each weekday. Dursley Town Council provides your local services. We strive to make Dursley a better place to live, work and play. Our website includes a wealth of information about how we conduct business and what we do. Use the search or browse the site to find whatever you are looking for. If you can't find the information you require then please contact us. 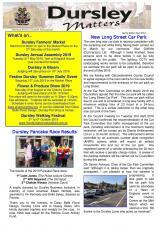 The latest edition of our quarterly newsletter is available to download from the Town Council's website. This edition includes the latest news on our Long Street Car Park project, Fixed Penalty Notices for dog fouling offences, Dursley in Bloom and the forthcoming Dursley Annual Assembly meeting on 21st May. Please note the Town Council office will be closed to the public for the Easter Holiday on Friday 19th April and Monday 22nd April. Please note this will include vehicular access to Kingshill Cemetery throughout the long weekend (Friday/Saturday/Sunday & Monday), pedestrian access is available as normal on these days. In the event of an emergency the Councillor's contact details are available on the Town Council's website: www.dursleytowncouncil.gov.uk. As you may be aware, the UK will be taking part in the European Parliamentary Election on the 23 May. Dursley Town Council have been asked to publish the Notice of Election. HTML5 validated. WCAG compliant. Page generated in 0.1416 seconds.